’Tis the season: U.S. News & World Report just released its list of Top 40 Diets, just in time for all of those new year’s dieters looking for the quickest antidote possible to their holiday overindulgence. It’s a swarm that comes out every year, like clockwork (See also: the annual People cover headline touting people who have lost “half their size,” and US Weekly’s “Diets That Work!”) But it’s somewhat surprising that one of the diet trends you may have heard the most about this year hovers toward the bottom of the USN&WR list: Fasting. Fasting doesn’t really qualify as a fad—it’s been around since biblical times, and many religions have used it as a devotional practice for centuries. In the past few years, though, fasting has received a few boosts as a prospective dieting method. Some doctors have touted its advantages, like Dr. Jason Fung, author of The Complete Guide To Fasting, and Dr. Michael Mosley, co-author of The FastDiet. 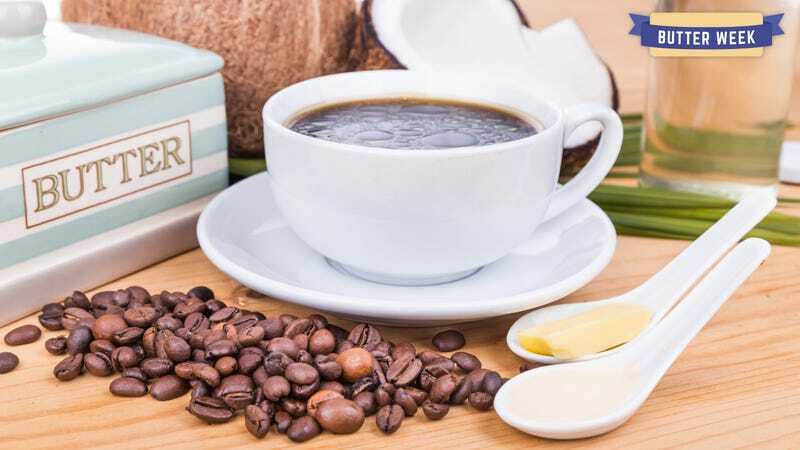 Then “biohacker” Dave Asprey started a veritable sensation with his “bulletproof coffee” method a few years ago, where you start the day drinking coffee whipped with butter and coconut oil to help stave off any morning hunger pangs while you’re fasting. As no one wants you to go on an actual hunger strike, there are a few options for today’s fasters: The 5:2 method, in which you only fast a few days a week, versus “intermittent fasting,” in which you only eat for a certain number of hours every day. Grappling with my usual new year’s diet, I was intrigued by this method: I have never been much of a morning eater, so I decided to try to limit my eating to 6 to 8 hours a day: Only from noon (or out to 2 p.m. if I can manage it) until 8 p.m. In the morning, I would have a huge coffee with a healthy slosh of cream, and then (attempt to) hold out until lunch. (Those of you who regularly read The Takeout may notice that I’m also doing Dryuary. Not eating, not drinking; I’m a ton of fun at parties right now.) There’s nothing to count, or keep track of, except the time. And when I told my internist about my plan, he seemed fairly unconcerned, just glad that I would be attempting to eat less. But even after a few weeks of my grande coffee with cream breakfast, I still was having trouble with the fasting part. If I wasn’t eating for at least 16 hours a day, shouldn’t my stomach be shrinking, making this process easier? Why did it seem like I was getting actually hungrier, especially around 11 a.m.? Was I just going to have to get permanently used to hunger pangs? In desperation, I thought that maybe the more complex fat structure in the butter part of the butter coffee could help me last until lunch without hallucinating that my laptop was in fact an ice cream sandwich. So one morning, I decided to step into the butter coffee fad. My daily hunger pangs were intense enough to make me want to give it a try. So on Tuesday I put two tablespoons of grass-fed butter in my to-go coffee cup (we buy the Kerry brand anyway), had it filled at my neighborhood Beans & Bagels, and shook it up as much as possible without alarming anyone on the train. (Bringing my hand-mixer in to work seemed a bit extreme.) While I really didn’t like the taste of it as much as my beloved half-and-half-dosed brew (I always drink what the English refer to as a “white coffee”), or the unsightly oil slick at the top of my cup, my hunger did in fact hold off for a little while longer. I was able to cruise past the 11 a.m. hour, and when my Potbelly order arrived around noon, I didn’t pounce on the delivery person. I was even able to put my beautiful sandwich aside for a few minutes before tearing through the paper. I was pretty sure I was missing the magic of butter coffee, though, so the next day I worked from home and threw the coffee, grassfed butter, and coconut oil combo in the blender. Unlike my sad experiment the day before, this butter latte came out nice and frothy. I hate words like “mouthfeel,” but the creaminess made this concoction much more palatable. And the coconut flavor helped it seem exotic. It was enough to make me start considering buying a cheap blender at Target and keeping it at the office, let’s put it that way. Even with all this stirred-up fat, though, my fast still only lasted until about noon. So 16 hours appeared to be my absolute limit before my stomach started telling my brain that I need to start gnawing on my own arm. In conclusion: Portugal is a land of contrasts. (Sorry, I love that bit.) In conclusion, I think I might buy that blender. I understand that fasting might not be for everyone, but in my current overfed state left over from 2017 (and beyond), it’s somewhat working for me. (And sure, the no-drinking likely helps this effort as well.) I can fit into my skinny(ish) jeans, which is something I couldn’t have done last week. Someday, I may be able to sit down in them again. Or even wear them out of the house. After all, it’s a brand new year, when hopes are high, resolve is ironclad, and the coffee is frothy.